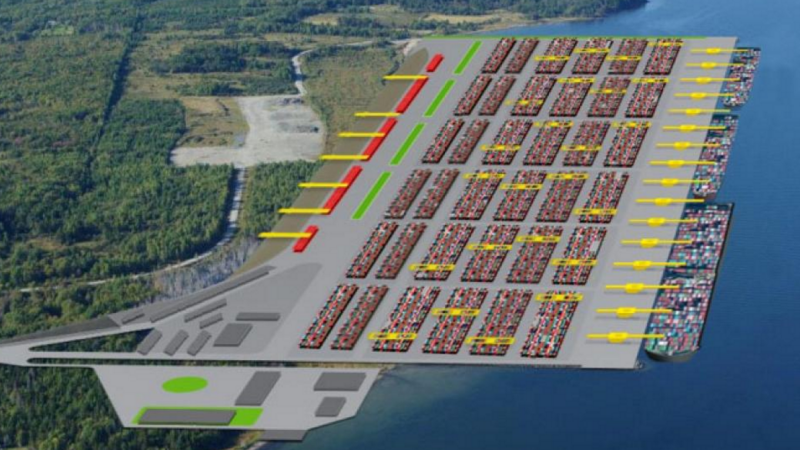 so the port of Sydney Nova Scotia is attempting to develop a megaport called Nova Port. The Idea is that it will be the Newest and greatest port on the east coast, and container lines and their 18000 TEU ships will flock to the port. The development is being done by SHIP Sydney Harbour Investment Partners, which includes China Communications Construction Company, Canderel Group, and Bechtel. yesterday they announced a partnership with Ports America to run the thing. SHIP has said that they will start construction as soon as they sign up sufficient business. Its not going to happen. First, Sydney Isn’t close to anything. getting containers to and from the port will be a pain. Sydney is 4 hours further up the road from Halifax, and the rail line, Cape Breton and Central Nova Scotia Railway, is near abandonment, having seen the last train from Sydney in December 2014 and likely in need of a massive overhaul to carry container traffic. A previous container service by Terra Transport via Marine Atlantic ferry to Newfoundland, was re-routed to Halifax in 1997. – in part because CN was uninterested in running trains to Cape Breton, favoring Halifax instead. this likely hasen’t changed, and its doubtful CN will be interested in having to deal with the traffic, as will will only serve to slow down their existing trains. Second, they keep referring to attracting Ultra Large container vessels, however no line currently has them calling on the East Coast of North America. while this might change, the large volumes occur in the pacific trade, and can justify these vessel sizes. its unlikely they will make the trip around when the smaller classes already service the routes with excess capacity. Third – the only way they can make a business case is if they can keep the cost of container handling lower then any other East coast port. Since most of the costs to handle containers is labour, they will either automate, reducing jobs, or attempt to keep the facility non union and pay lower wages then any other port. Finally, of note, Ports America abandoned its lease in Oakland, declaring bankruptcy for its operation there. That terminal handled 1/5th the traffic in the port of Oakland, which ran 2.4 million teu’s in 2014. Port Americas share of traffic in Oakland was about 100,000teu more then that entire port of Halifax handled last year. If they cant make that operation work – how are they going to make Sydney work. My thought is SHIP is basically playing with other peoples money. They will make money whether anything is built or not. they will collect management fees, market the investment opportunity, and collect government subsidies. I don’t think any major shipping line is ever going to want to call on Sydney, and this mega port will never be built. Look, Sydney NS does have a business case for port development. It has an excellent location in the Gulf of St Lawrence, close to Newfoundland. and inland waters. Its a central location for a tug base, or many other marine services. But a mega container port. no way. This entry was posted in news, port on December 14, 2016 by Peter.